‘The wheels on the bus go round and round’—until they catch fire | Where to next? If we’d been in a movie, the flames would have shot 20 metres in the air and the bus would have exploded just when we got close enough to be saved by a local hero or blown into tiny pieces that had to be scraped off the nearby newsstand. But it wasn’t a movie, so the crowd surged forward to watch the burning bus and the fire department turned up in time to bring everything under control. The newspaper reporter in me is so glad we didn’t miss this. 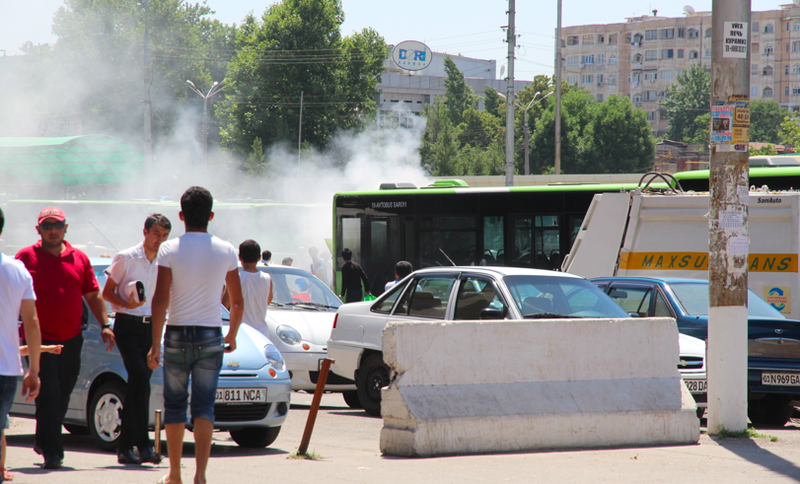 We were descending the stairs from the Kukeldash Medressa (more about that soon), when both Poor John and I noticed smoke billowing from the back of a local bus. My instinct for getting a decent picture for the front-page kicked in and I rushed forward to get a closer look. Poor John hesitated and pointed out the knuckleheads who were throwing buckets of water on a gas-fueled fire. Hmm, not smart, so I stepped backwards for a moment, then realised this wasn’t a movie and the chances of the bus exploding were slim, or at least a couple of minutes away. So I snapped away until a random fellow on the street crossed his arms to signal that photos were forbidden. 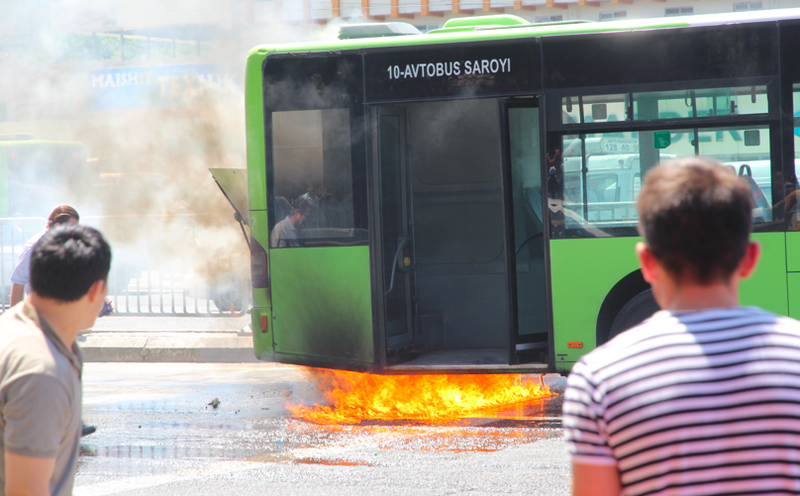 ‘Oh, pleeze, Mr Do-gooder, what could be wrong with a few pics of a bus fire’. But I was pretty sure I had a couple of decent pics so put the camera to the side and watched the fire crew hack their way through the seats at the back of the bus and then spray foam all over the disaster. I was pleased to see that the captain (er, bus driver) stayed with his ‘ship’ until he was forcibly told to go. All the passengers were gone (left not deceased), by the time we noticed the commotion. When we finally walked away, there was still a bit of fire under the bus, but we hung around the bazaar long enough to know that it never blew up. Not sure that it will ever run again either. ← Watch-ya wanna buy in Tehran’s big bazaar? How exciting! And how different is the culture that lets the public get so close! Can’t imagine that happening here. The whole episode was most extraordinary. Traffic wasn’t diverted or really even slowed down. 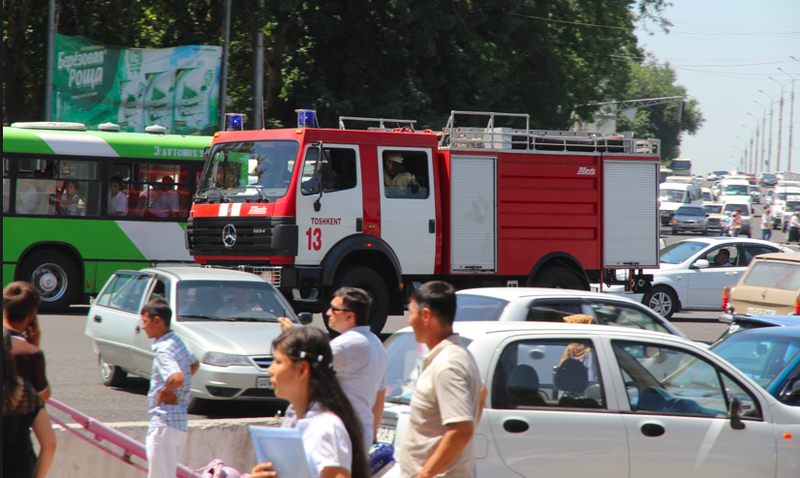 And it wasn’t until the fire truck arrived that people were forced to retreat a few metres. Oh my goodness, Sy, Uzbekistan is growing up. Wait until you see pics of the really modern buildings. That said, there are still plenty of donkey carts roaming around.